The Brad Muirhead Quartet (aka BM4) (the latest of numerous small-group configurations since 1996-ish) Brad's original modern jazz outlet currently featuring Brad - bass bone, Jared Burrows - guitar, Brent Gubbels - bass and Bernie Arai - drums. BM4 has just released its' debut CD titled "OLD/ IN / OUT / NEW" featuring guest artists on several tracks, including vocalist / pianist Jennifer Scott who has been added to the group as a permanent “guest” (aka “BM4+1”). Treesong (2018…) Brad’s latest project features his original compositions for David Gowman’s “Fuhorns”. The Fuhorns are beautifully hand-crafted, funky-looking, funky-sounding and each one is unique. A good way to describe this project-in-development is “adapting contemporary composition techniques to a set of newly discovered stone-age instruments”. Koan (2006...) Chinese world-music jazz featuring all original compositions by group members. Brad - bass bone, Jun Rong - erhu, Chenguang Xiao - suona & bamboo flute, Jared Burrows - guitar. Originally featuring Tommy Babin - bass, Pepe Danza - percussion. Brent Gubbels (bass) and Bernie Arai (drums) have since replaced them. Another original group member & Suona master Zhongxi Wu occasionally rejoins for a guest performance. Idverb (2014) spoken word and music (improvised and composed) featuring Kedrick James - voice, Brad - bass bone, Lisa Miller - piano and Stefan Smulovitz - viola & laptop. 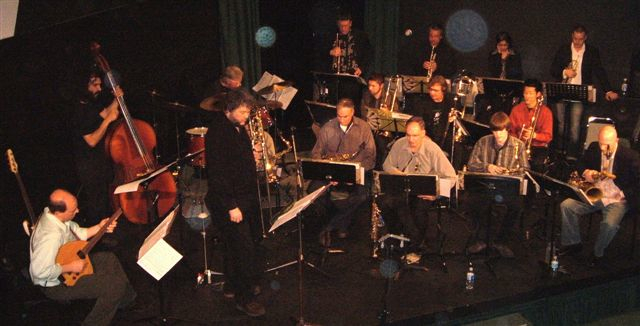 The East Van Jazz Orchestra (EVJO) (2007...) large ensemble original-music project co-led with Jared Burrows. BRASS ROOTS (Brad's first project as a leader) Funky street jazz, New Orleans based with a west coast Canadian edge. ROOTS was highly active through the 1990's, and has come out of retirement once for a CBC live radio show in 2010... so who knows? Primal Orbit started in the early 1990's with Brad on sousaphone, Tony Wilson on guitar and Stan taylor on drums, playing no-holds-barred freeform jazz. Orbit evolved into a written arrangement based septet with Brad eventually moving over to the trombone chair, and was active until 2004.